In October 1936 200 men from the North East town of Jarrow marched, along with their MP Ellen Wilkinson, to London in protest against mass unemployment and extreme poverty. 75 years later, the youth group Youth Fight For Jobs are re-creating the Jarrow march to protest about youth unemployment. One of the speakers at the opening event was Lizi Gray, great grand daughter of one of the original 1936 marchers, who will be walking parts of the route inbetween studying at college. The Daily Mail, who ran a supportive piece, claim 30 people will walk all or most of the route, one of a number of ways in which todays march differs from the original. Rather more depressing was the decision by Jarrow council to charge the marchers for road closures in Jarrow caused by the march. Whilst Indymedia have dubbed the 2011 march an ‘astroturfed’ as opposed to ‘grassroots’ action, claiming it’s main aim is to win the Socialist Party more members, I still believe that the march is worth supporting. 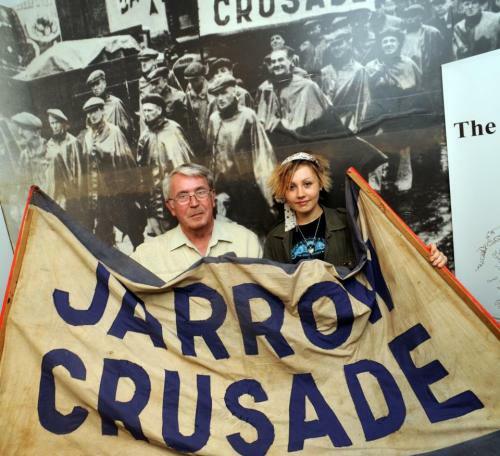 Joanne Fradley recently wrote about the plight of unemployed young women, an ever increasing group, and whilst the Jarrow march is not explicitly about gender, it is about youth. I am hoping that many young unemployed women will be inspired by the march to get involved, and to make their voices heard. Whilst the original 1936 march is remembered warmly, and the marchers received a great deal of support and public sympathy, political assistance was not forthcoming from the ruling National Government (the coalition of the day…), despite Wilkinson’s best efforts. It is impossible to predict if the 2011 march will be any more successful, but as you will see from their website, it is a rather different campaign, which has evolved differently, and which exists in a different context to the original. The march set off from Jarrow on 1st October. The marchers will be arriving in Leeds on the 8th October, in Nottingham on the 15th October, Coventry on the 22nd October, Northampton on the 29th October, arriving in London on the 5th November. To find out more, visit Jarrow March 2011.